I’m planning to attend the ILOC Scottish rally next weekend so had a few jobs to do around the Atlas. First off I fitted a new rear – normally I get them fitted at the shop but this time round had to get the levers out myself! I haven’t fitted a tyre (aside from the 100’s but then that’s like a bicycle) in over 20 years but it proved relatively straightforward. I did it in two stages when I tired (sic) on the Friday evening and finished the job next morning. 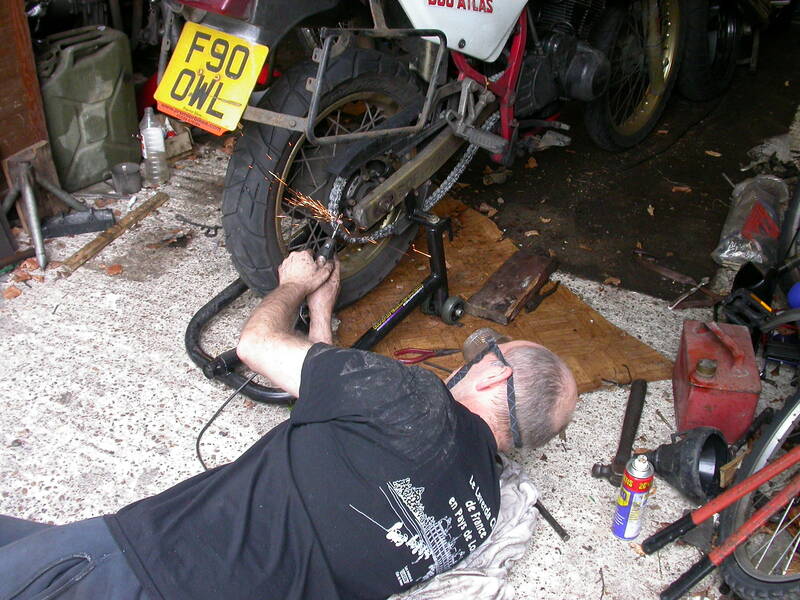 Top tip is to get a set of plastic rim guards – you can wield the levers with far more confidence. The weather allowed me to turn my attention towards the RGS. I stripped the master cylinder and front brake caliphers. I’d swollen the seals using citreon hydraulic fluid so it all had to be cleaned through. I also touched up some of the frame and started cleaning years of dirt off the front wheel – my idea being that it won’t be immaculate but why not make what I have look as good as can be. Despite the reluctant Atlas the weekend was a success in terms of helping me to get back onto the RGS. If I can get this going then it’ll free up the Atlas a little and allow me to try and sort out that starting. The sprocket was replaced by a 41 tooth item (42 is stock) that is listed as 3 teeth over stock for a Ducati Pantah. I’m pleased to have found an easily available replacement. I was also pleased to find that the replacement spacers I’d had made up held the wheel perfectly and there appears to be no play in the cush or wheel bearings. What pleased me less was that the chain came 2 links longer than I ordered. 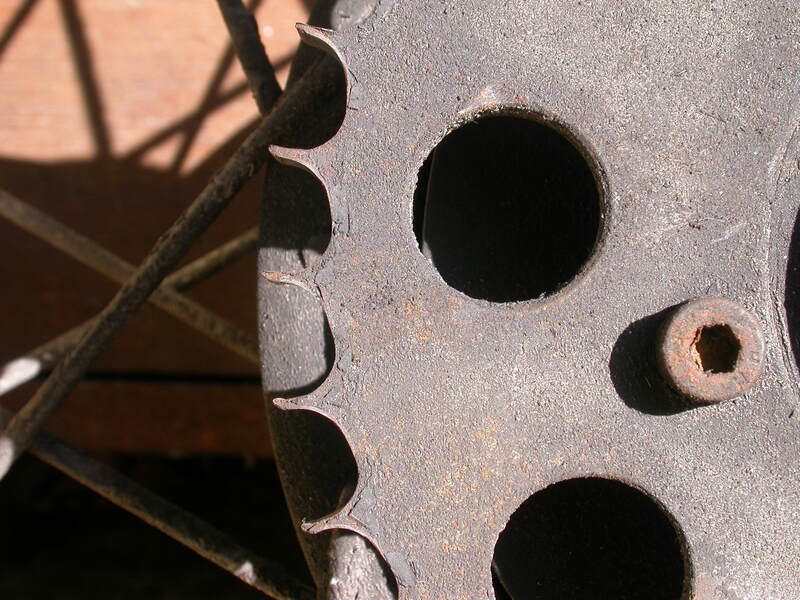 I didn’t find this out until I’d fitted the chain so it was out with the Dremmel…It was only once I’d got it down to 108 links that it then hit me that of course the smaller rear sprocket will also require a smaller chain. The wheel is therefore right back on its adjusters but I thought I’d go for this as when I had the wheel a long way forward it fouled the mudguard. I think therefore I’ll run it like this and when it gets a bit of stretch take out another link. A further piece of Atlas miscellany came to me during some idle time over the week. In the Ainscoe Laverda book there is a picture of an early Atlas at a show. A Mark 1 with the exhaust on the left side of the motor no less (and a fork brace just above the tyre so under the mudguard). Wonder why it went into production with the exhausts on the right necessitating them to pass under the carb’ to link up to the silencer? I wonder if the final versions were merely using up left over stock from the original prototype run – so rather than this costing more to produce actually represented a saving? Starting has been poor again this week but the sprag has held up. I know I ought to check the valve clearences but the last thing I want to do take off the cam cover and find problems. A pathetic head in the sand approach but one that has to stand while I wait to get my RGS back on the road and therefore have a Laverda contingency. On this score I must say the ILOC AGM gave me some inspiration – all those triples made me think how much better life could be…. Well not too much to report other than I rode the Atlas over to the ILOC AGM on Sunday. It was a bright but cold day. Zipping through the Cotswold backroads put the Atlas in its element and everything was good with the world. 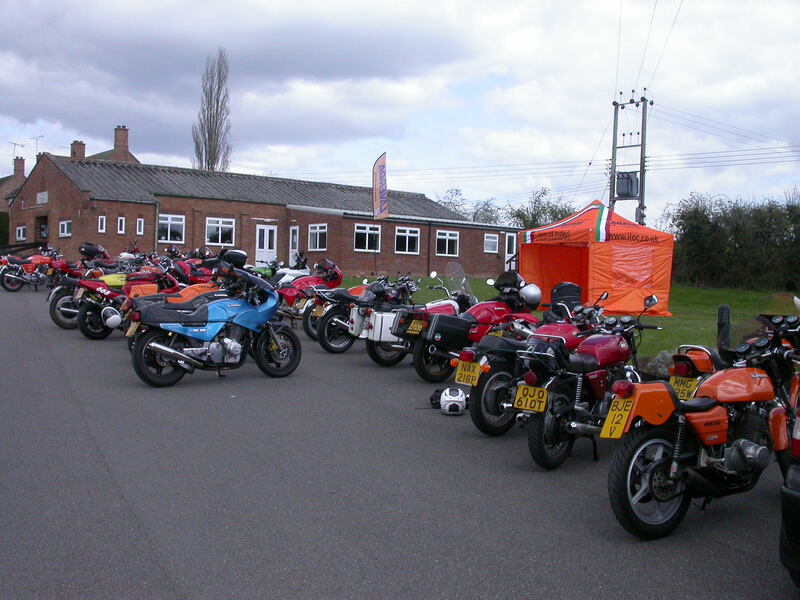 The meeting was well attended with a lot of interesting bikes on display. So often you just see standard or restored Laverda’s these days but the variety and innovation on display was heartening. I even got to chat to Phil Todd who showed interest in the Atlas (tho’ slight dismay at the knackered chain and sprockets it is running…). I didn’t come away empty handed either as I picked up a foam air filter for my RGS or RGA. I already use one of these and they don’t wear out (unless you clean them with an spray can cleaner) so should be a useful investment. Disappointment did greet the start of the week when the Atlas failed to start after the Easter layoff. The battery seemed to have been hit by a combination of cold mornings and not being started for four days. This whole starting issue is getting to me…. Well a Bank Holiday weekend and little progress to report. I was full of good intentions but got distracted by a visit to the garden centre and friends down in the New Forest. Still this poor showing in the garage was a reaction to a week of trouble free commuting on the Atlas, which is at last showing signs of settling into a trouble free routine again. 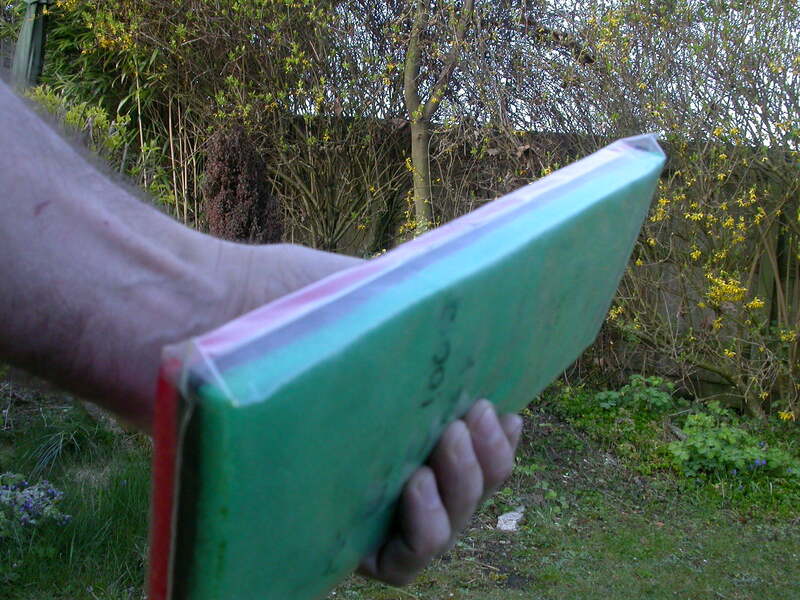 I saw a post on the Laverdaforum from Bob Dixon looking for an alternative to the Atlas sprag which isn’t up to the job of starting his Atlas based racer. I will watch this with interest as I agree with Bob that the sprag just isn’t up to the job. Reading this reminded me that I have no more 10.3mm rollers so I’ve sent an email to Leo Zimmerman to see how much for a couple of sets. 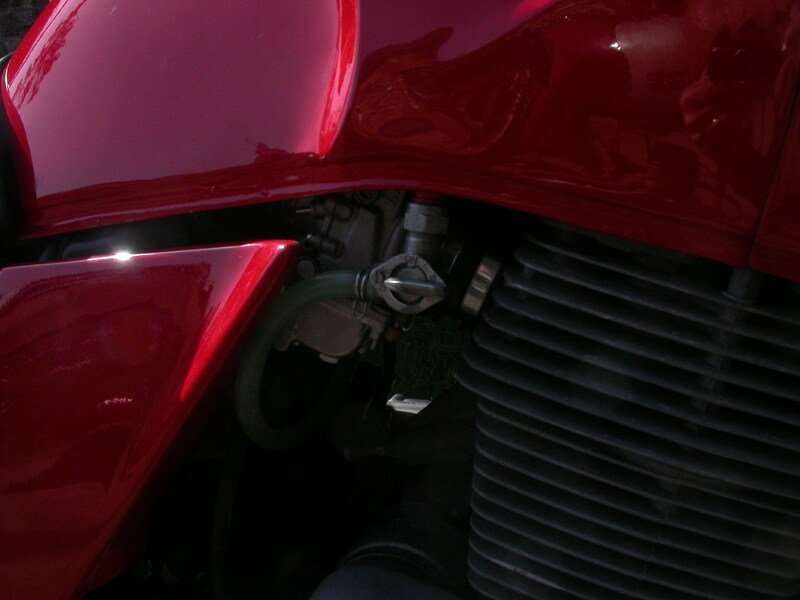 I changed the oil (Morris 20/50), and adjusted the chain, and while I did so took the opportunity to run the VFR up to full operating temperature and adjust the back brake on the Turismo – and you thought multi-tasking was something only women can do! First ride out on the 100 since the National Rally in June 2011! Having put the head back on last week I decided to see if it would start…and it did! Out with the spanners to go round the nuts and bolts, ignore that the back light and horn didn’t work, drain some year + old petrol out of the RGS (one way round the current UK fuel shortage) and it’s off to the Banbury ILOC meet. The 100 ran OK and it wasn’t ’til I was a few miles down the road that I remembered this was the first time out on the new valves. I think a combination of freshly lapped valves and a new spark plug thread made it feel stronger than I remembered. A fresh spring day and a round trip of 80 miles made for a great ride out. 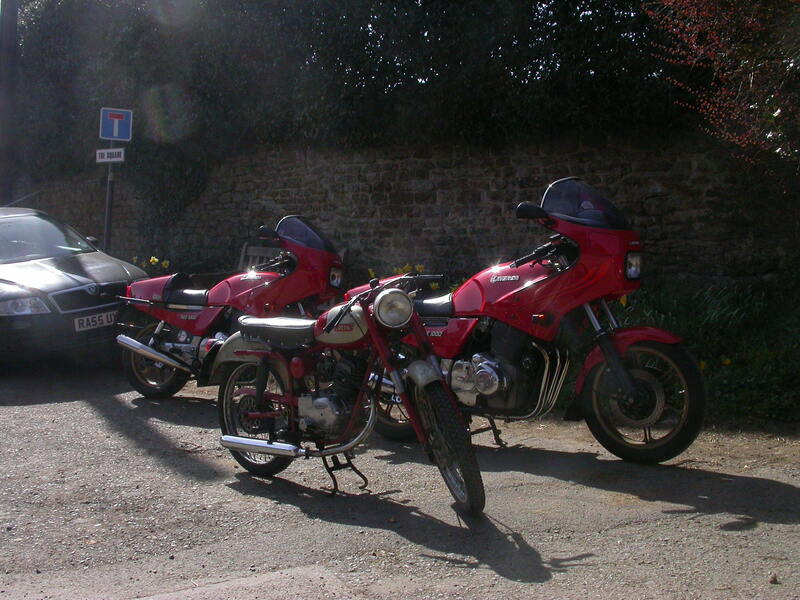 The ILOC meeting had just four Laverda’s – a 668, two RGS’s and the 100. The RGS’s are both immaculate. Alan Cudlipp’s has won numerous ‘high mileage concours’ awards at ILOC meets despite having over 130,000 kms on the clock. 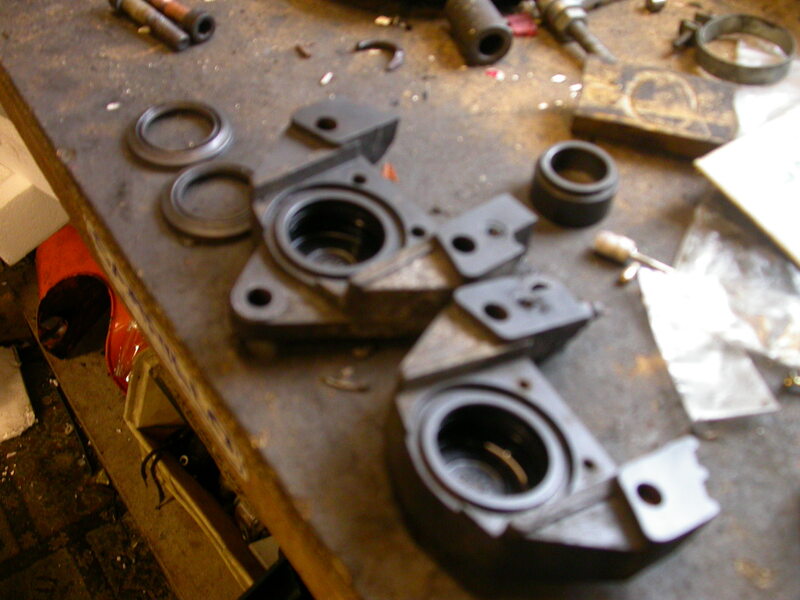 In all that time the only thing it has needed is the infamous outrigger gearbox bearing. Rob Bradbury’s RGS is the bike owned by Neil Todd – easily distinguishable due to the Mirage tank stripes on the side of the fairing – looks neat. The bike now sports RGS had Mikuni carbs. These need a bit more setting up but are claimed to outperform the Dellorto’s. I was surprised at how much smaller they appear. This modification is my favourite type – a good idea but one that takes an experienced eye to spot (I didn’t). I was amazed to hear that both Rob and Alan claim 40 mpg. Fair enough they both know their bikes so if my RGS ever runs again I shall have to investigate why I never seemed to get more than 35 mpg. We sat and talked Laverda nonsense for a couple of hours before heading our separate ways. The Atlas did a full week’s commuting to London, although on Tuesday it needed the help of AA roadside assistance…a minor problem with the electronic ignition wiring block coming adrift but I forgot to pack the right size allen key to get the sidepanel off so had to wait for help (what an arse)! 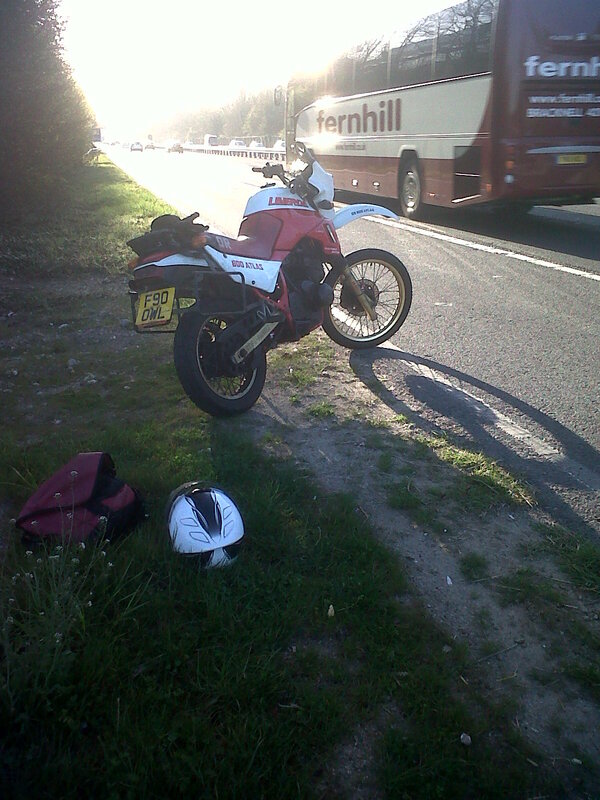 It was a 2 minute fix followed by the tedium of 20 minutes listening to the AA man tell me all about his T140 and Harleys…hmm.